Shangri-La's Rasa Ria Resort on Pantai Dalit Beach set amidst a nature reserve, the resort enchants endlessly with its natural magic. Your Malaysian-themed room is perched on a verdant hill, with a spectacular beachfront view. The resort is home to an eco-friendly championship golf course and the magnificent Spa at Dalit Bay. 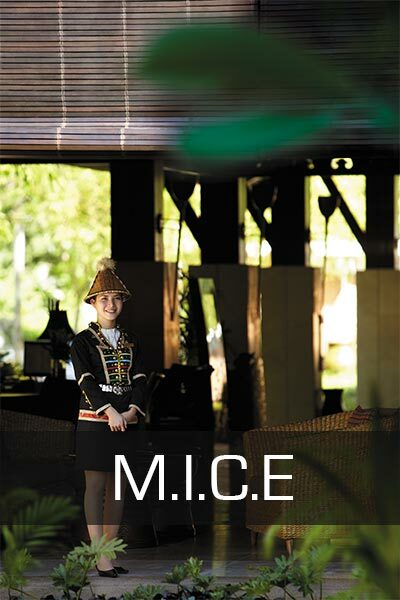 The resort is a premier spot for successful meetings and memorable celebrations in Sabah. It offers luxurious facilities and the classic professional Shangri-La service amidst natural beauty. From a feast for 600 to a cocktail party for 1,000, the Grand Ballroom with its 7 metres ceiling and 750 sq. metres of open space offers generous size and elegance. Eight other Function Rooms and a Boardroom augment the meeting facilities. Shangri-La's Rasa Ria Resort & Spa, Kota Kinabalu, offers bespoke destination meeting and leisure solutions for your valuable team. Only here can you choose from a multitude of pleasurable activities and suitable venues for a successful business holiday in a luxury resort setting.